APHA hosted the 8th annual modelling symposium at its headquarters in Weybridge in February 2018. The aim of the symposium is to spread knowledge and encourage communication between modellers and policy makers. 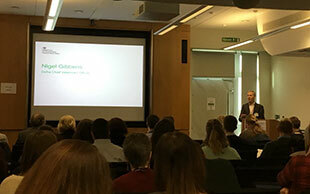 Nigel Gibbens, former Defra Chief Veterinary Officer, introduced the day and outlined his objective for the attendees to learn to improve the effectiveness of modelling projects by following good practice examples presented by the speakers. This year’s theme was ‘using models to evaluate policies and intervention strategies’. 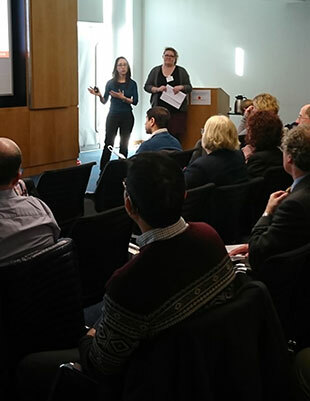 More than 70 people from government and academia were brought together to discuss key areas where mathematical models had been used to help design government policy in health related areas. Keynote speaker, Rowland Kao, from the University of Edinburgh, opened the symposium talking about how 'big data' can be used to inform complex models using bovine tuberculosis (TB) as an example. He stressed when building models of complicated systems, such as livestock health controls, it is very important to create a team that really understands how the system works so the results of the model can be fully understood. 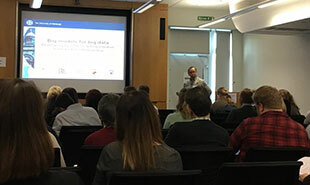 APHA’s Colin Birch expanded on the topic, covering the different types of mathematical models and how important it is to set an initial question that a mathematical model needs to answer, using foot and mouth disease and bovine TB as examples. Colin indicated that by being clear on the point of a model it is easier to pick the most appropriate modelling method. Adam Klecskowski from the University of Stirling, talked about a decision support tool that was developed for the Forestry Commission to help them assess the risk of tree pests and pathogens to the UK. By finding out from those wanting to use the tool what they wanted to use it for, he was able to develop a single tool that was widely applicable in a number of different situations, rather than them needing to use several different tools. Having looked at both plant and animal health in previous presentations, Kyriaki Giorgakoudi then demonstrated use of an economic cost-benefit model to evaluate different components of vaccination campaigns in a public health example. Group B streptococcus (GBS) can cause serious disease in new-born babies, and using a mathematical model that includes all the criteria involved in assessing vaccines, this work concluded that maternal immunisation could be a cost effective intervention to reduce infant disease for GBS. Kyriaki’s invitation to the event was brought about through her involvement in the Royal Society pairing scheme which brings together policy makers and scientists to share knowledge and experience. Kyriaki was paired with APHA’s Helen Roberts who chaired the session. Aaron Reeves from SRUC (Scotland’s Rural College) outlined some advice for ensuring models can be used effectively over a long period of time for policy purposes, covering transparency, traceability and reproducibility. He indicated that by following this advice, everyone will understand exactly how the model works, they can see what changes have been made and when, and the model will be able to reproduce the results of previous analysis. Amie Adkin explained some of the benefits of maintaining, updating and using the same model over a number of years, using a model that was first built 14 years ago for monitoring trends in bovine spongiform encephalopathy (BSE). The results produced have built a picture over time of the changing risk from infection entering the food chain. Most of the changes can be mapped back to points where there were changes in the process for monitoring infection in animals. The meeting was brought to a close by APHA’s Helen Roberts in an interesting final question and answer session for the audience to all the speakers. 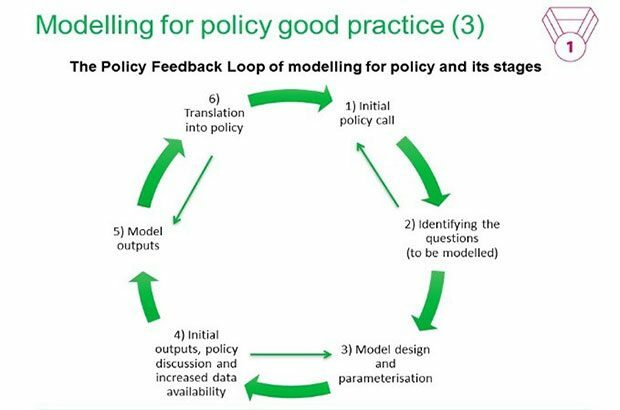 The main discussion point was on how resilience should be developed to ensure that modellers and policy makers have the skills to continue making the best use of models. The symposium stimulated lots of interesting debate and discussion points. Please feel free to leave comments in the comment box if you were there and enjoyed the event, or if you have any questions on how modelling can contribute to research and society. Follow APHA on Twitter and don't forget to sign up to email alerts.